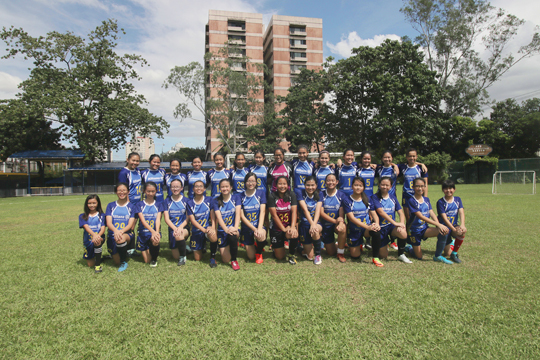 In a sport largely identified with men, a team of young girls from the Immaculate Concepcion Academy has formed a sisterhood that goes beyond winning games. The ICA team has been training under the Xavier Football Club every Wednesday, Saturday, and, if needed, on Sunday as well. Their school doesn’t have a field, but that didn’t stop these girls—whose ages range from 11 to 16 years old—from pursuing the sport they love. While they got into football in different ways—some had family members, who were already in the sport while others were enrolled by their moms—the girls share the same passion for it. “When I started football, I just fell in love with it,” says 15-year-old Traci Lim. Self-confessed soccer mom Bernadette Pantoja (third from left) with her equally sports-minded girls (left to right) Iya, Adrianna, and Daniella. Getting into the sport wasn’t as easy though. It’s not that the girls didn’t have the skill to stand out. Far from it. It’s more because football is still not seen by some people as a sport that women can excel at. “I think we’ve all had our fair share of experiences but one that has affected me is when my teacher asked me what sport I played and when I said football, she asked, ‘Isn’t that a man’s sport?’ I didn’t see it as an insult; I used it as an inspiration to prove her wrong and do better,” goalkeeper Darryle Tangco said. Like many young football players, Iya dreams of making it to the national team. “That would be really nice, to be able to play on the national team, but my main goal would be to get a scholarship through football, so I can get in to a good school and become a doctor,” she says. Iya, along with her sister Adrianna, are members of the ICA team. “We were toddlers when we already started playing football. And then, we tried a bunch of other sports but then; we think football was the one we stayed longest in. I didn’t see why a girl couldn’t play the sport?” Adrianna said. Their mother, Bernadette, who was a student athlete back in the day, was the one who encouraged her daughters to get into sports. “Having played football back in college, I am so glad that I now get to share the experience with my daughters. Football is a tie that binds our family. I will never trade the countless weekends spent under the sun watching them play. For as long as they are willing, I will never grow tired of cheering for them. I will always be proud to be called a soccer mom,” she said. The team has even found a staunch supporter in Allianz, a global insurance company that runs one of the most successful international football camps through a partnership with FC Bayern Munich. One of the pillars of the company’s corporate social responsibility program is social inclusion, which it tackles through sports and sustainability projects. With a company such as Allianz on their side, it was enough to boost the morale of the girls. Dealing with discrimination is just one of the lessons that the girls have learned from playing football. “I also learned self-discipline, perseverance, hard work, and balance. These things are important even when you’re outside of the field,” says Iya. They have learned the value of reliability. “For example, when you’re running on the field for 45 minutes and you just want to stop because you’re tired, you can’t just do that. Your team needs you,” Iya adds. In overcoming both the physical and emotional challenges that come with a sport, the girls are blessed to have the staunch support of their family, especially their mothers. Strong women on their own, these “soccer moms” guide their young daughters not just in excelling in the sport that they love most, but in maintaining a life outside of the field as well. “I always tell Alexa that in life, you should have a balance. You should always know when to do things at the right time,” Laura Maclang said. She, like the other moms, are glad that their girls have found a sport that they don’t just love but can learn a lot from as well. “It has helped develop her communication skills, which is very important during the formative years,” she said. Traci’s mom, Ting Lim, noticed that her daughter has learned to manage time and become more disciplined and responsible. She was the first to bring the kids together, nurturing the girls’ love for the game by making sure they train regularly. For the case of Traci, she was lucky to be selected, to be part of a national team training camp. From there, she learned how to manage her time. She became disciplined. She became more responsible. Laura takes pride in the fact that in playing the sport, the girls have learned to look out for each other. “The team has unity. They take care of each other not only during their time on the field but outside of it as well,” she says. Just as the girls pull each other up during challenging games, their moms are there to listen to their frustrations and guide them in overcoming them. “We always tell her that no one bad performance defines you as a player. The important thing is you come back stronger,” Anya’s mom, Tecel Fuentes, says. Bernadette sums up the bond that their daughters not only share with their teammates, but with their families as well. “Football is a tie that binds our family. I will never trade the countless weekends spent under the sun watching them play. For as long as they are willing, I will never grow tired of cheering for them. I will always be proud to be called a soccer mom,” she said. By playing football, the ICA team has shown that playing sports transcends genders, creates friendships, instills discipline, and, more importantly, fosters strong family bonds.